This tooth was found about 25 years ago on a beach in New Jersey. Size is about an inch for both length & width. I believe it's an herbavoire tooth, but I have no idea what animal it could have belonged to! Doesn't quite look like a horse, cow, or oxen. You are right it does not look like cow, horse, or oxen. 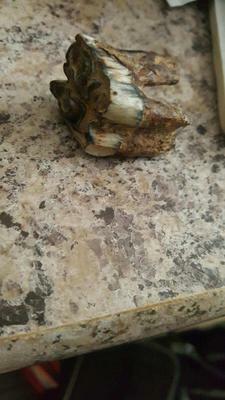 I don't know what animal this tooth is from but it may not be herbivore. I have a tooth similar to this that is from a cave bear.